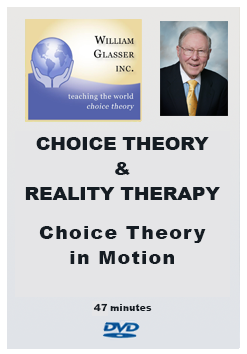 Author : William Glasser, M.D. 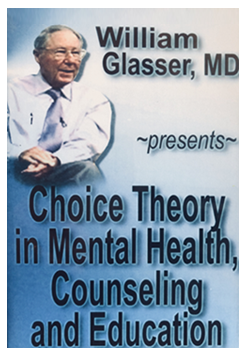 In this booklet Dr. Glasser explains that if you put his ideas into practice, it could save billions of dollars and help millions of people improve their own mental health totally separate from what is now called mental illness by most mental health professionals. 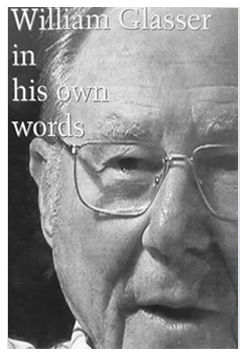 “My recent effort, explained in this booklet, is to define the term mental health in a way completely different from the way it has been defined for over a hundred years. 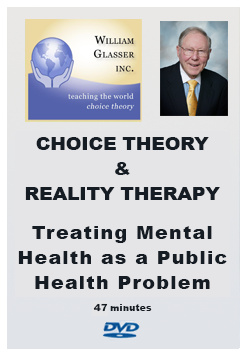 Psychiatrists, clinical psychologists, social workers and counselors call themselves mental health professionals but few of them can define, describe or explain what mental health or mental well-being actually is.“ “I and all the people who work with me through The William Glasser Institute start from the premise that mental health is an entity totally separate from mental illness. 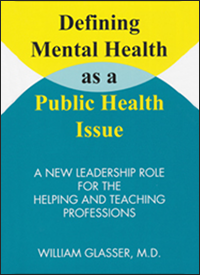 After you finish reading this booklet you will have a clear idea of why it is entitled, Defining Mental Health as a Public Health Issue, and how it can be used to help improve the quality of their lives.”– William Glasser, M.D.